I think if you look up Atlanta United in the dictionary you just this goal. The pace at which they hit Colorado on the counter here is something pretty much nobody in the league can keep up with, and it’s why so many teams sit so deep and defend when playing against Atlanta. If you let Miguel Almiron, Hector Villalba, Josef Martinez, Julian Gressel and company run at you, it’s simply not going to go well for you. It’s interesting timing writing this after Paul Tenorio’s column this week on high-performers in MLS not being rewarded adequately with salary increases, in which he used Gressel as a relevant example. I don’t think very many people expected Julian Gressel to contribute as much as he has since being drafted 8th overall in the MLS SuperDraft. There was also talk that maybe his 2017 production wasn’t sustainable, or was system dependent, or that with new signings (looking at you, Ezequiel Barco) maybe Gressel wouldn’t play as much. It’s still reasonable to say he benefits from the system and the players around him to take a lot of attention away from him, but you can’t really argue with Gressel’s numbers. Gressel has been even better for Atlanta in 2018, despite being asked to play less attacking positions so far this year. I’d never really considered it before reading Paul’s article this week, but I’m not sure I’d argue against Gressel being worth a TAM contract for Atlanta United. Some may argue he wouldn’t put up these numbers for another team, but I’m not sure that should matter. He is doing it for Atlanta, and that’s the team he plays for, so he’s worth it to them. Remember when the Montreal Impact started out with just three wins in their first 13 games? Headed into June, the Impact had three wins, 10 losses, and looked like one of the worst teams in the league. They’re still fighting for their playoff lives, and next week’s matchup against DC United is going to be massive, but the fact that they currently sit in a playoff spot, and ASA’s model has them at 61.1% to make the playoffs is frankly shocking given how they started. That this goal came after a 15 pass sequence against the Philadelphia Union is ironic, given how the Union have gained a reputation this year for being one of the more patient teams in the league when in possession. Even though he’s not involved in this goal, I want to use this opportunity to highlight how important Evan Bush has been to the Impact this year. Bush is second in MLS in GA-xGA, at -7.42 meaning he’s allowed 7.42 fewer goals than would be expected based on our keeper xG model. Only Stefan Frei has been better by that metric this year. For a team that has the 3rd lowest xG in MLS with just 34.5 xGF, and a -6.7 xGD, Bush’s performances this year have been vital to them being in the position they are. Dax McCarty is good. You all knew that. Without Dax not only does this goal not happen, it’s likely Orlando are off on a counterattack. Now, it is Orland, so I’ll let you judge how dangerous that counter would be, but that’s not the point. Dax stops Orlando’s counter in its tracks, and then finds de Leeuw in space to set up this goal. It hasn’t been a great year for Nemanja Nikolic, who has struggled to retain his form from 2017, or Michael de Leeuw who has missed most of the season with injury, playing only 183 minutes so far. Actually, it’s been a rough year all around for the Fire, but this game shows the elixir that is playing against Orlando. The Fire’s 2.27 xG in this game was their most since April 28, and while they’re out of the playoff race, it must have felt good to play a game like this. Sporting Kansas City are first in the West, and their 1.82 ppg is 3rd best in MLS. Still, I can’t help but wonder where they might be if Felipe Gutierrez had been healthy all season. Might they be in the thick of the Supporters’ Shield race? I wouldn’t be surprised. Gutierrez’s numbers aren’t eye popping: 0.42 xG+xA/96 minutes. SKC has four players with higher xG+xA/96 than that in Johnny Russell (0.6), Daniel Salloi (0.53), Krisztian Nemeth (0.51) and Khiry Shelton (0.51). Johan Croizet and Gerso Fernandes also sit right at 0.42 with Gutierrez. That said, looking at SKC’s record and performances with and without Gutierrez this season and there’s a clear difference. 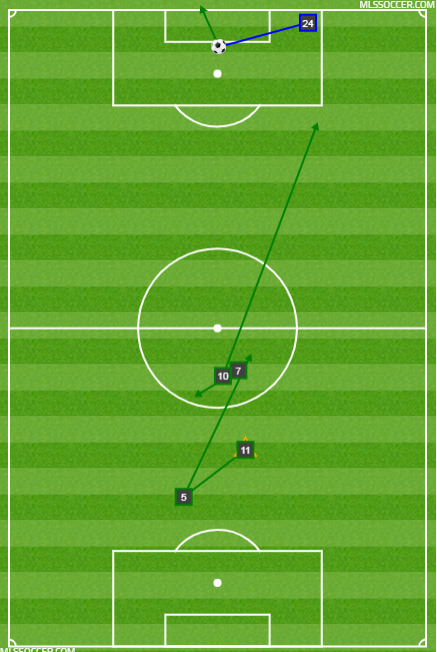 There were about 12 games that Gutierrez missed due to injury (I included his first game back, where he subbed on late against NYRB in the “injured” games). The most glaring difference is the actual results. SKC earned 2.13 ppg before Gutierrez got hurt, only 1.33 while he was injured, and have been on a 2.25 ppg pace since he came back. Their expected goals are only marginally higher since his return, but they’ve figured out how to defend. I was curious if there was anything else that might have explained SKC’s bad run from May-July, so I took a look at home/away games. Turns out they played 5 home games and 7 on the road while Gutierrez was hurt, compared to 9 home and 7 road while he was healthy. However, in road games with a healthy Gutierrez, SKC was 5-1-1. On the road while Gutierrez was injured they went 1-4-2. Basically the point I’m trying to make is the obvious one that Gutierrez is really important to SKC. The BIGGER point I’m trying to make is that while I think a lot of us are not super high on SKC’s chances going into the playoffs, maybe we shouldn’t sleep on them. The Houston Dynamo have the 3rd best xG and 3rd best xGA in the Western Conference. They’re second in xGD. Yet they find themselves closer to the bottom of the conference than a playoff spot. Even their actual goal difference is top five in the West. Eight of their 13 losses have been by a single goal. Oh, and they’re in the U.S. Open Cup final and might represent the U.S. in CCL next year. Weird team. Fun team. This game was very much a reminder that this team, and especially Alberth Elis, are fun to watch, and at their best are very very good. Yes, there have been some rough patches this year, and Dynamo fans and critics alike will surely point to the fact that Elis has scored just nine goals from the run of play on 13.5 xG (run of play) in 2018, but that shouldn’t take away from how dangerous of a player he is. The playoff push might be over for the Dynamo, but if they can beat Orlando on Saturday, (which, c’mon, it’s Orlando) they’ll head into next week’s U.S. Open Cup final with a bit of confidence, and when they’re confident, this team is still one of the most dangerous in MLS. Our top save of the week according to our goalkeeper xG model comes from Bill Hamid. This really shouldn't be a shock, as Hamid is known as a great shot-stopper, and had a few big saves in what was a wild Atlantic Cup matchup against NYRB last weekend. The more I watch this save the more impressed I get because as that ball is played in from wide, Hamid has to be aware of so many different things that it’s impressive he’s able to react so quickly to make this save. At minimum, he’s got to worry about the potential (unlikely, but still possible) of a shot being taken from wide, Marc Rzatkowski and Bradley Wright-Philips both making runs to meet the ball in, and he also has to be ready for the ball to potentially be chipped into the middle or back post which would create a challenge given his position on the front post. Great save Bill, I’m sure D.C. United fans are glad you were in net and not David Ousted.